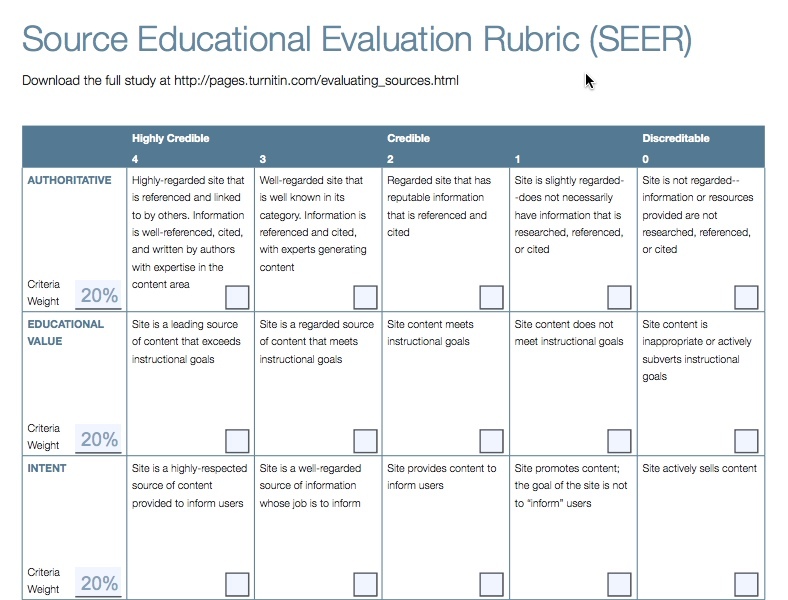 Turnitin worked with educators to develop The Source Educational Evaluation Rubric (SEER), an interactive rubric to analyze and grade the academic quality of Internet sources used by students in their writing. Instructors and students who use SEER can quickly evaluate a website and arrive at a single score based on five criteria scaled to credibility: Authority, Educational Value, Intent, Originality, and Quality. "SEER is a tool to open a discussion with students about evaluating sources and to stress the importance of using quality sources in academic writing. I think SEER is a brilliant idea that will help students become better writers."